Nada-it WAS Newbery month! Ooh wait-I think I finished Mr. Pip by Lloyd James in January-very good book! I found Posy by Linda Newbery and Catherine Rayner when I was CTC yesterday and instantly fell in love with this beautiful picture book! I absolutely love the illustrations by Catherine Rayner. It’s so easy to imagine how soft she would be to pet, her curly whiskers give a little peek to her personality, and she reminds me of all the reasons I convinced my soon-to-be-husband (1996) that I needed not one, but two kittens. I love the big accessible font that will pull kids into the story. Even the jacket flap is written in a font meant to read by kids. Lookybook has a free e-newsletter called Take a Look! that comes weekly. This week’s had some great autumn picture books, as well as some newer books. One great use for this website if you have a projector in your classroom would be to be able to project the pictures from the book to a larger group as you read a book aloud. You could even set up the projector with the book as a station/center for small group use. I think kids would think it was fabulous. I still get a kick out of clicking the book pages back and forth. I can’t think of any reason why the school filter would not allow the website, but I will have to play around with it at school this week. Another great use would be to use the computer(s) in your classroom for students to either use as a station, or to enhance your classroom library. Here is one of the books featured in this week’s newsletter. Yesterday I found an interesting website called Lookybook. Their tagline is “Picture books you can discover, share, and talk about”. The site allows you to collect and share your books. The site is also where you can also “read” picture books through the website’s interface. Worth checking out! 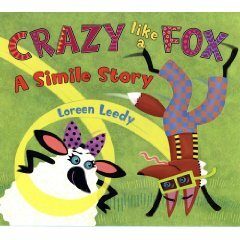 Crazy Like a Fox: A Simile Story by Loreen Leedy is the newest book by this very fun author. I first became familiar with Leedy while using her book Postcards from Pluto as a mentor text (way back before I even knew what they were) for writing our own postcards and books about the planets when that was part of my science curriculum. Since then I have had the opportunity to meet her at the now defunct The Ohio State University Children’s Literature Conference (boy I miss that opportunity to see so many great authors) and she has now written around thirty books. While I have been unable to continue using Postcards from Pluto in science, it is still a great mentor for that type of short, fictional/nonfictional writing. 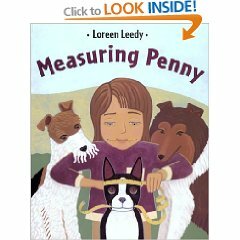 I also am a big fan of Leedy’s Penny books, Mapping Penny’s World and Measuring Penny.Both texts fit into the current fourth grade curriculum-measurement, map skills, and are also great read alouds. The newest Leedy book, Crazy Like a Fox, starts with a great, child friendly explanation of what a simile is. In Ohio this is always a tested topic, and also one that can be difficult for teachers to help students have a working understanding of, especially as they need to also know idiom, metaphor, etc. The story progresses as the main characters Rufus and Babette chase after each other until they run into a surprise party for Babette. Each page includes not just the similes that described what Rufus and Babette are doing, but also has little asides as other minor characters comment on Rufus and Babette, all spoken in similes. The book also includes a nice section at the end about creating your own simile story that teachers will find helpful and students will have fun participating. 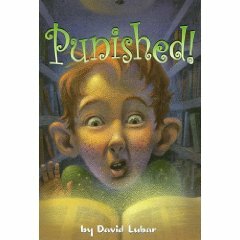 If you are trying to teach similes, idioms and metaphors, check out Punished by David Lubar. This short little chapter book is a great read-aloud and chronicles a boy’s attempt to earn back his ability to speak without it all coming out as puns. Today I taught my first model lesson for three other teachers in fourth grade. I thought it went pretty well. I was nervous the day before when meeting with the teachers to talk about the lesson, but once I was in the classroom with the students, it felt very natural. I did have several things going in my favor: It is a lesson that I had done successfully in my classroom last year; I know many of the students since my daughter is the same age; it was in the classroom of the woman who used to be my co-teacher until this year. I don’t think I could have gotten a more comfortable setting for a first time! 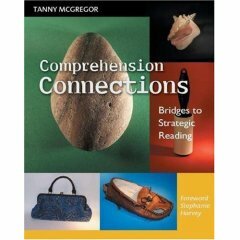 The lesson is one I had read about in book entitled Comprehension Connections: Bridges to Strategic Reading by Tanny McGregor. The lesson is called Reading Salad. I really like the set-up she describes of telling students that you bet they are really good at pretending. You then go onto to explain that they are going to pretend to the be teachers and you are going to pretend to be a student. Remind them teachers are very serious about reading, so they should be very serious because they are going to be grading me as a reader (while pretending to be a student). 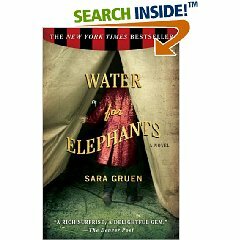 I selected the book Water for Elephants by Sara Gruen for my role as “student”. The book it is one that I know many of the teachers read last year as we had had several ongoing conversations about it at lunch. I read aloud (with a couple choice words removed) parts of the first two pages of the prologue. I did (accidentally) stumble over a word or two and also have to go back and reread one sentence when my “editing” made the sentence unclear. When done I asked them to give me honest feedback about me as a reader. They were very complementary, as was last year’s group, despite my couple stumbles. When asked why they thought I was a good reader, they offered things such as “you knew all the words”, “you used expression”, “it seemed like a hard book” and other similar offerings. I then revealed to them that the first time I had read that part of the book, I had been very confused about what was going on, and also shared that I went back to the prologue and reread it many more times as I was reading the book as I figured out new things that I didn’t know when I read it the first time. They were very impressed that I would reread part of a book more than once because I wanted to. On the fly I remembered a story that my teaching partner had shared with me about her son, who is now a senior in high school. She was very excited that he had learned to read and when she went to parent teacher conferences for the first time, she told the teacher how proud she was of his reading. The teacher (as it so happens, was my mother-which makes the story even funnier to the kids) informed my teaching partner that her son wasn’t reading, but had memorized certain books. She asked her to write some of the words out of context to see if her son could read them. He could not. This story was a perfect tie-in to the rest of McGregor’s Reading Salad lesson as you ask the students, “Since you are so good at pretending, I bet you’ve been able to pretend you are reading or that you understand something you read, when really you didn’t.” We did a turn and talk with a partner and then shared some instances of when they have “pretended” to read or understand when they really didn’t. It is AMAZING how honest they are about times they knew the words, but didn’t understand, or only looked at the pictures, or flipped pages without reading, etc. The most promising sharing was of a student who shared that sometimes she stops and daydreams about what is happening in the books when she is reading, instead of continuing reading (perfect springboard to come back to for visualizing). I went on to explain the Reading Salad part of the lesson. You have a bowl with green pieces of paper marked “text” and another bowl with red pieces of paper marked “thinking” (this is opposite of what is described in her book, but a modification that I found worked better for me after last year’s students). There is a third bowl marked “salad”. I put two students up on stools/chairs on either side of me and held the salad bowl in my lap. 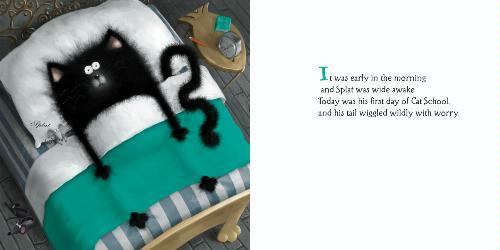 I read aloud Splat Cat (see earlier review) as a think aloud. Each time I read text, green text “lettuce” was added to the salad and when I stopped to do the think-aloud, red thinking “tomatoes” were added until the book was over and there was a salad. This year I also added orange carrots to represent unknown/unfamiliar words. The lesson ends with a specialized Venn Diagram of a book (text) intersecting with a head (thinking) for Real Reading (not pretend reading!). I will post a photo of our chart later this week so you can visualize. As I stated at first, this is a modified lesson from the McGregor comprehension book. She has many other great, hands-on, visual, or concrete lesson for launching your strategies lessons. Later this week I will then like to follow up with a lesson that Franki Sibberson describes in her book Still Learning to Read: Teaching Students in Grades 3-6.